Create a beveled or round edge of exact 5mm radius. 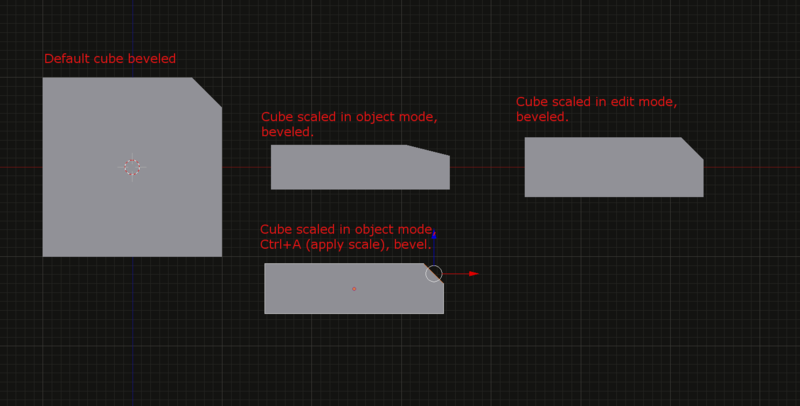 Bevel works exact with edges between 2 faces with the same dimensions. But if the dimension of faces is different problems come out. As you can see the angle is not of 45° in the second mesh. The following attachment is the blend file I used to simulate the bug I forgot to attach it to the original post. Brecht Van Lommel (brecht) assigned this task to Howard fletcher (howard). Hope this will be solved before the release of Blender 2.7. I tried the newest version of blender (2.71) but this bug seems still present in there as well as in the 2.69. My apologies, I don't want to appear inappropriate. I'm just curious to be up to date or informed on timing about this. Thanks everybody for your work. Sorry to jump in here, but I don't see this as a bug. You must either apply scale before doing bevel or scale in edit mode. Hi, Joel mailed the list and this is indeed not a bug, we had this reported before, its common misunderstanding (modifiers are executed without object transformation applied in most cases. Thanks for checking on this, closing. Thanks a lot! Your suggestion worked like a charm and has solved my problem! Any way, I read http://wiki.blender.org/index.php/Doc:2.6/Manual/Modeling/Meshes/Editing/Subdividing/Bevel to learn how to bevel but here is not included your suggestion. This is because I was going out mad to work around to bevel edges but this solution is awesome! It could be a good idea to add this clarification to the online blender manual at the page I linked. This comment was removed by william willybid (willybid).